“Fear not your destiny, for you have shaped it well.” This line from Gavin’s novel seems to sum up what this movie is trying to communicate. You own your future, your happiness, so make it what you want it to be. Synopsis from Amazon: Gavin and Paul, meet and fall in love over a holiday weekend where family and friends are planning the wedding of Paul s sister. 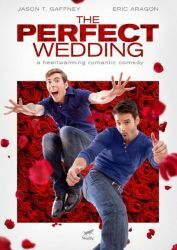 The problem is, Gavin is posing as the boyfriend of Paul’s ex and the two find themselves in a classic comic quandary as they try to ignore their feelings. I didn’t take a lot of notes on this film – it’s a pretty simple and straightforward movie. Boy meets boy. Boy can’t have boy. Boy realizes he might have boy. Boy chases after boy before he leaves forever. But a recurring note is about happiness. We see people creating their own happiness (or unhappiness as the case may be) by their own actions. We see Alana’s mom planning a huge wedding that she doesn’t want, but she’s going along with it because she thinks that what her mother wants. Roy wants Gavin to pretend to be his boyfriend so he doesn’t appear to be unhappy. Paul is atoning for when he made Roy unhappy. But we eventually see each person taking charge of their own life and owning their happiness. The father says, “You know what we have? We have right now.” It’s about taking the moment, making it yours, and leading yourself to being content with your choices and your life. We watch Paul and Gavin falling for each other almost from the moment they meet. It’s a little awkward, but cute at the same time. Their pop culture connection, similarities in sleep habits, late night conversations… it’s like it was meant to be. Except there is a lie preventing them from getting together. I have to admit, the movie is a little cliche. It uses some pretty standard plot devices, and the ending could write itself. But you can tell it also has heart, and a few twists to make it a little different from every other romantic comedy where someone chases someone at the end before they leave to never be seen again. It’s not going to knock your socks off, but it’s a cute film that reminds us to be happy, now. We can’t necessarily change the past and who knows what the future will bring. But we can be happy right now. As a side note, I truly don’t understand the cover. These two never jumped out at anyone and it wasn’t an action film….